What is Alcohol Use Disorder (AUD)? Alcohol Use Disorder (AUD), commonly referred to as “alcoholism,” is a condition that can manifest differently in different people. Typically, it means that you find yourself unable to control the quantity of alcohol you consume. You may obsessively think about getting your next drink, continue to drink alcohol despite clear evidence that alcohol is creating problems in your life, or experience withdrawal symptoms when you suddenly decrease or stop drinking. AUD ranges from mild to severe, and mild AUD can quickly intensify. Early treatment is essential to prevent serious consequences to your health, career, and family. Is there a cure for AUD? In the past 30 years, with the development of anti-craving medications, alcohol addiction has gone from an untreatable, lifelong disease to a manageable condition. Medication, combined with coaching and therapy, can help people to unlearn their unhealthy drinking patterns. Many of our members have gone from habitual bingers to occasional drinkers—or even stopped drinking completely. Some find that they don’t need the medication anymore after reaching sobriety, while others continue to use the medication to maintain their low drinking levels for the rest of their lives. As with any condition, however, it’s best to treat AUD early. The more, and the longer you drink, the higher the risk will be of developing diseases like cirrhosis, heart disease, or cancer. How does Ria Health's program work? How effective is Ria Health's program? How effective is Ria Health’s program? On average, Ria Health members reduce their drinking by 70 percent within the first six months. The vast majority of our members see an increase in non-drinking days, a decrease in the number of drinks per week, and binge drink much less. To learn more about the efficacy of our program, see here. Does your program work for everyone? While most of our members significantly reduce their drinking, there can be no guarantee that any particular member will be successful. Some people find they are unable to tolerate particular medications, while others may not be motivated to work on adjusting their drinking patterns. We understand the complexities of managing AUD. How long is your program, and how much does it cost? We encourage our patients to stay in our program for 12 months. This length of time has been shown to allow the body to recover. It’s also been demonstrated that new habits take about 12 months to take root. The program costs average about $250 per month, but many insurance providers are beginning to cover it. You may be eligible at little to no cost. Verify your insurance here. As your recovery stabilizes, you will have a discussion with your physician about the right path forward after graduating from the Ria Health program. They may recommend that you keep taking your medication. In any case, we always encourage you to keep monitoring your relationship to alcohol. Do I have to check into an office? No, all check-ins with our medical team and recovery coaches are done remotely, via our secure, HIPAA-compliant app. Our program is designed to give you the tools to take control of alcohol without disrupting your everyday life. Who are Ria Health’s recovery coaches and what do they do? Ria Health’s team of certified recovery coaches is an integral part of the Ria Health program, working with the medical team to help members build their skills and confidence, so that they can overcome alcohol cravings with medication-assisted treatment (MAT). All of our coaches have the credentials to practice substance abuse counseling in their state of residence. They use evidence-based practices like mindfulness, SMART strategies, motivational interviewing, and other elements of cognitive behavioral therapy (CBT) to give Ria’s convenient 15-minute check-ins maximum impact. Ria coaches support members on their journey toward freedom from the frustration and shame of alcohol use disorder. All Ria Health coaches have received training in confidentiality, ethics, and boundaries. I think someone I love should use your program, can you help me? If someone has recognized they need help, but are afraid that typical treatment options might disrupt their life, work, or relationships, our program may be the right choice for them. Our program is designed to be discreet, and our community is growing quickly. How can medication help me drink less? We prescribe our patients one (or more) of five medications to reduce alcohol cravings and consumption: naltrexone, acamprosate, topiramate, baclofen, and gabapentin. Naltrexone and acamprosate are FDA-approved for treating alcohol addiction; the others are prescribed “off-label,” and many scientific, peer-reviewed studies have demonstrated their effectiveness at treating AUD. During your initial consultation, your doctor will review your medical history to determine which medication or combination is right for you. For more information on how these medications work, check out our blog. What happens if I drink while I’m on the medication? The medications we prescribe are safe and non-habit-forming. You and your doctor will monitor your progress. Our program is designed to empower you to decide if you want to continue drinking or simply stop. How does Ria Health compare to other treatment options? How does Ria Health compare to other online treatment options? How does the Bluetooth breathalyzer work? What’s the purpose of breathalyzing? Behavior modification is a fancy way to say “creating healthy habits.” We are creatures of habit, and research shows that small nudges like taking the stairs or opting for water during meals can make a big improvement to our well-being. Taking a picture of your medication and testing your BAC with the breathalyzer will become a habit that gives your treatment team daily updates on your progress. Where do I get my breathalyzer? Included at no additional charge, Ria Health ships every new member a handheld Bluetooth breathalyzer for use with your care plan. When your breathalyzer arrives, take a look at the help video. If you have any problems, contact us at (800) 504-5360 or customerservice@riahealth.com and we’ll be happy to help. My breathalyzer isn’t working. How do I fix it? Make sure your batteries are fresh. Check if the breathalyzer is on—it should show a blue light. You can turn on the breathalyzer by pressing the button on the side for a couple seconds. If your breathalyzer has a screen, check that the breathalyzer is in app mode. Press the silver button for 10 seconds to change the mode the device is in. If you installed the BACtrack app (in addition to Ria Health), please uninstall the BACtrack application. The breathalyzer can only function with one app at a time. Try clearing data, uninstalling, and reinstalling the app. Still having trouble? We’re always happy to help. Contact us at (800) 504-5360 or customerservice@riahealth.com. Is it alright for my loved one to continue drinking? Ria Health uses a modern approach to problematic drinking called harm reduction (as opposed to abstinence), which uses Medication-Assisted Treatment (MAT) to help people reach their goals with drinking over time. Through MAT, people are able to decrease the amount of alcohol they drink over time. Your loved one may decide that abstinence is the right decision for them after successfully reducing their drinking. Shouldn’t my loved one stop drinking if we know they have a drinking problem? Alcohol Use Disorder (AUD) is tricky. Drinking heavily over a period of time—as little as a few months—will change your body’s and brain’s response to alcohol. When someone goes from drinking regularly to complete abstinence, they may experience a range of withdrawal symptoms. These problematic symptoms can range from repetitive intrusive thoughts (aka “cravings”), insomnia, tremors, seizures, and many more very uncomfortable and sometimes life-threatening problems. In an attempt to avoid putting your loved one through any unnecessary suffering as they address their drinking habits, our medical team advises clients to start with medication and moderation management techniques as a way of moving toward abstinence or controlled drinking. Is it a reflection on me that my loved one can’t stop drinking? Nope, nope, nope. Supporting someone with AUD can be frustrating at times, so please reach out if you’re feeling overwhelmed at anytime during this process. You can check out the homepage of the Ria Health app for self-care resources. Will my loved one have to stay on the medication prescribed in this program indefinitely? It’s recommended that people who wish to continue drinking moderately also continue taking the medication as prescribed. If your loved one decides to become abstinent, they may no longer need to take the medication. I don’t want my loved one to drink at all. How can we compromise while they’re part of the Ria Health program? It’s completely understandable that you want alcohol out of the equation, especially if it’s caused frustration and grief in your relationship. Think of this program like a weight loss or training program. While most people wouldn’t expect someone who’s 40 pounds overweight to just stop eating for a while, it’s common for people to expect those with alcohol problems to just stop drinking (for a while, or forever). Going through periods of restriction with food or alcohol will actually make cravings more intense and harder to work through. This is why people often fail at both abstinence-based recovery programs and super-restrictive diets. Instead of focusing on the presence or absence of drinking, help your loved one stay compliant with the treatment plan laid out by the Ria Health medical team. 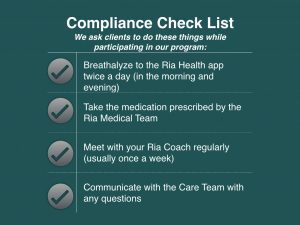 Check out the “Compliance Checklist” below for details about what Ria Health asks of its members. You can also try to compromise. For example, agree upon a blood alcohol content (BAC) reading that your loved one will try and stay below for the week. If their readings were around, say, 0.1 the week before, a realistic goal would be to stay below 0.09 all week. Creating achievable goals is a crucial part of the Ria Health program.